As Union gunboats approached Richmond, the Confederate capital, on the morning of May 15, 1862, they were greeted with a hail of heavy artillery fire from what would come to be known as Drewry’s Bluff, a Civil War fortification perched high above Virginia’s James River. Named for local property owner Augustus Drewry, the commanding heights offered a prime position for Confederate defenses, which were constructed just in time for a small but critical role in the 1862 Peninsula Campaign: by halting the advance of the Federal squadron—led by the famed ironclad USS Monitor—the artillerymen at Drewry’s Bluff closed off the Union’s option for attacking Richmond by water. 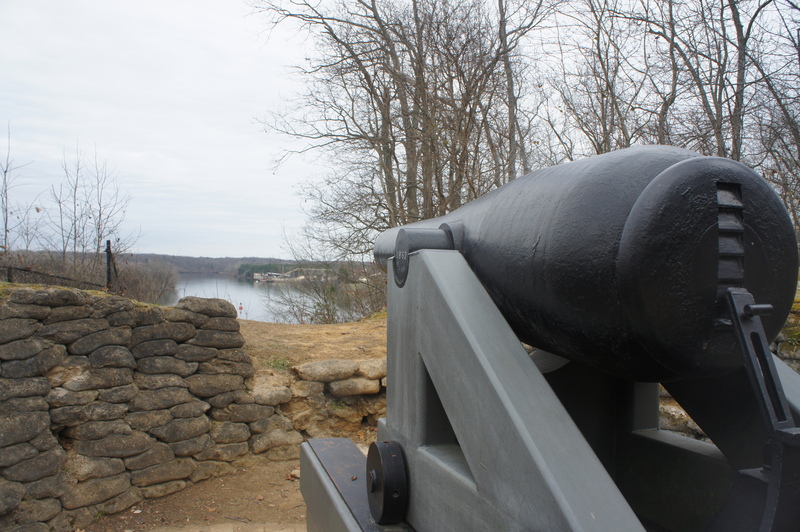 Today part of Richmond National Battlefield Park, a nearly 1-mile round-trip hike circles the fortifications at Drewry’s Bluff, some of the best preserved in the area. The highlight is an 8-inch Columbiad cannon positioned at the cliff’s edge. 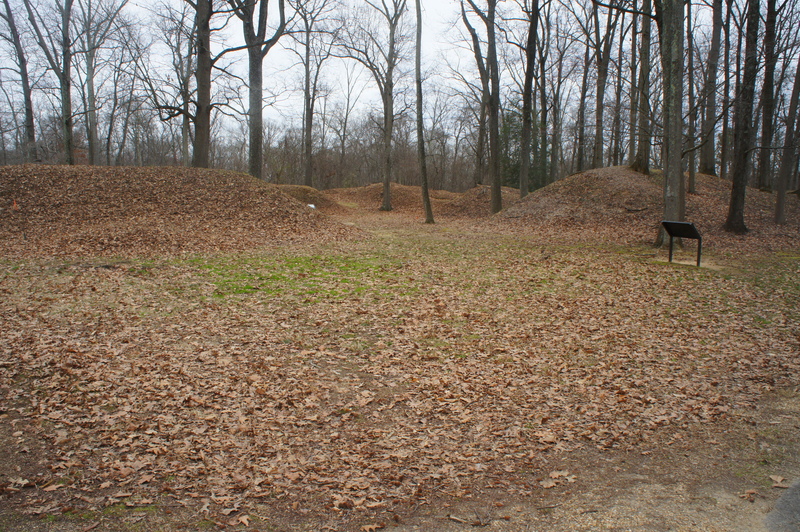 Despite being on the official Richmond Battlefields driving tour, Drewry’s Bluff is relatively quiet and perhaps overlooked. 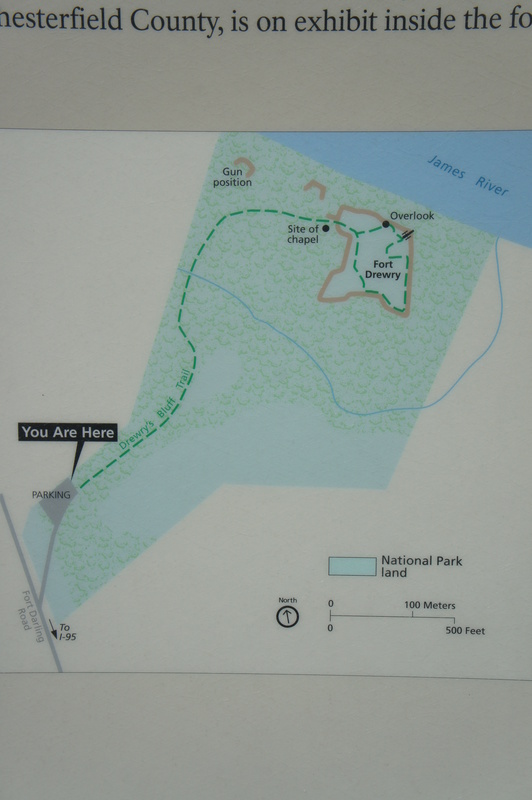 At the parking area is a three-paneled sign with information on Drewry’s Bluff, Richmond National Battlefield Park, and the 1862 Peninsula Campaign. To the right of the sign, the path follows a wide, paved track as it bears northeast through the woods. After about 150 yards, the path bends slightly left, skirting a field of tall grass on the right. 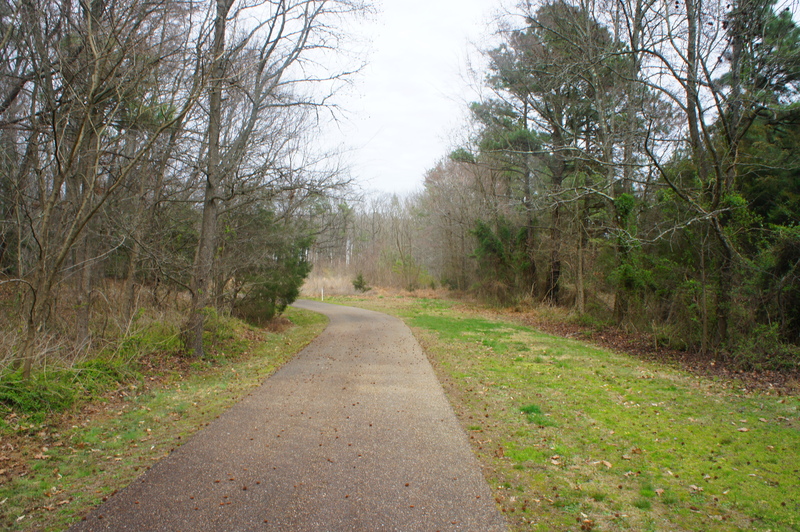 In another 70 yards, the path abruptly turns from smooth pavement to a rough mix of packed dirt and gravel. At 2/10 mile, the narrowing trail descends rather sharply to cross a minor stream, then climbs to the first of several interpretative signs on the trail. Just to your right, there once stood a small hotel, part of the wartime encampment at Drewry’s Bluff. At the sign, a short spur trail bears off into the woods to the left, approaching the edge of the earthworks. A second interpretive sign tells the tale of Camp Beall, a Confederate Marine outpost that was constructed here after the May 1862 battle. Returning to the main trail, continue east until reaching an open grassy pasture, with the bulk of the earthworks beyond. Off to the right, there is little remaining of what was once the grounds for a small chapel and cemetery constructed during the war. We fought the enemy for almost four hours…and such a perfect tornado of shot and shell, right, left, front, rear, and on top of us, never was seen before. It was an awful sight to see our killed and wounded, some with an arm or leg blown off, some entirely disemboweled. 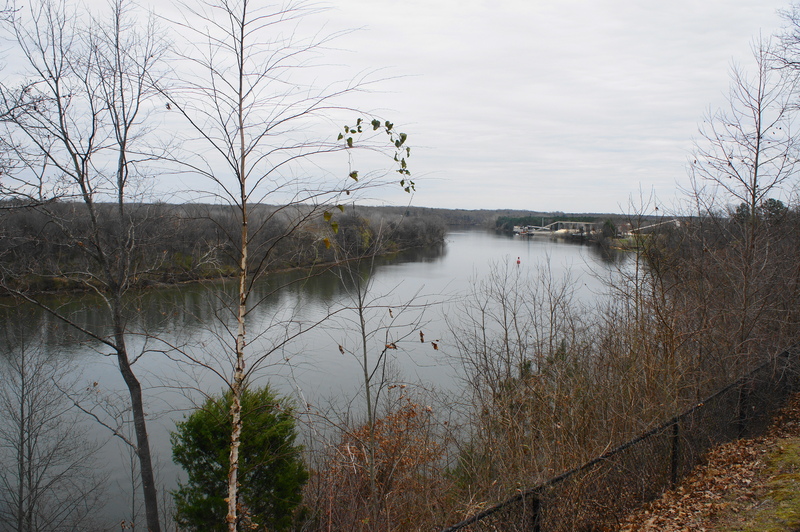 As the five Union ships rounded the bend on the morning of May 15, the squadron set its sights on neutralizing the Confederate defenses at Drewry’s Bluff, the last significant obstacle to a Federal entry to Richmond. However, before the USS Galena, the lead ship, could let off its first shot, it came under fire from the gunners at Drewry’s Bluff. During the more than 3-hour battle that ensued, the Galena would take 44 hits, reducing the gunboat to a badly-damaged “slaughterhouse” in which 13 were killed. Up on the bluff, the Confederate defenders comprised the Southside Artillery—led by Captain Drewry himself—and a handful of navy sailors who, just days earlier, had set fire to the famed CSS Virginia, the South’s first ironclad, to avoid falling into Federal hands. (Note: The USS Monitor, the Union foil of the Virginia, also fought in the battle and was undamaged by Confederate fire.) The Southerners also took casualties from the attacking Federals, and their defense was compromised in part by human error: the 10-inch Columbiad quickly went out of commission after recoiling so severely that its physical supports broke down. The Confederate defense held, however, and the Federal ships were forced to retreat by midday on May 15. The story of the battle is told through a series of interpretive panels at the main viewing platform. The Union gunboats would have traveled upstream from around the bend to your right, halting just before the bluff before they were forced to turn around. 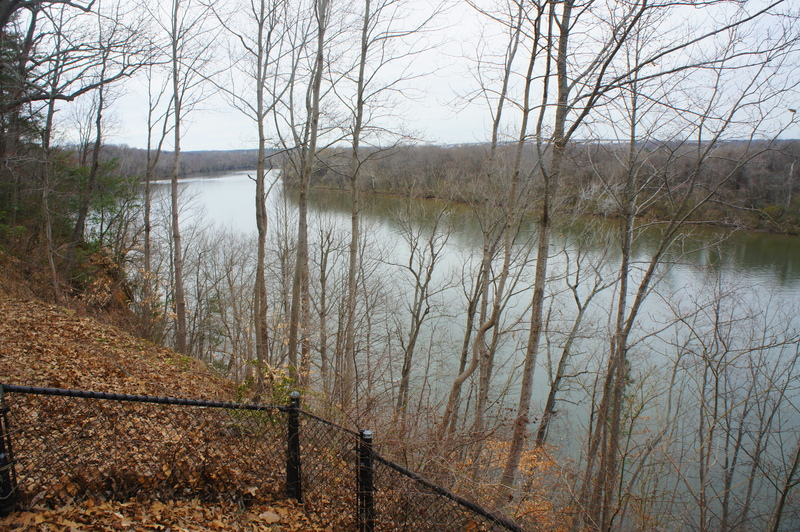 Today, the James River is quiet and calm, bounded on both sides by thick forest. 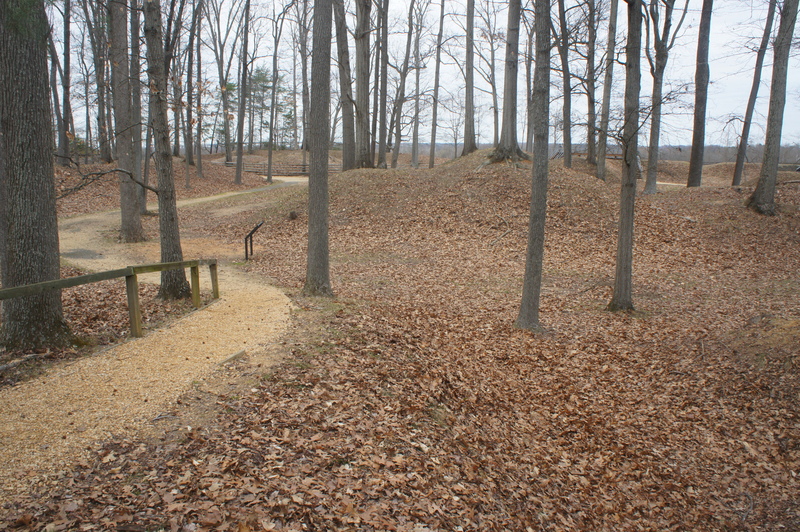 From the overlook, continue the hike by descending a flight of stairs back to the base level, then proceed to the foot of the 8-inch Columbiad, the only cannon remaining at the site. Just beyond, the dirt trail winds around a large depression in the ground, the site of a collapsed bombproof during the war. 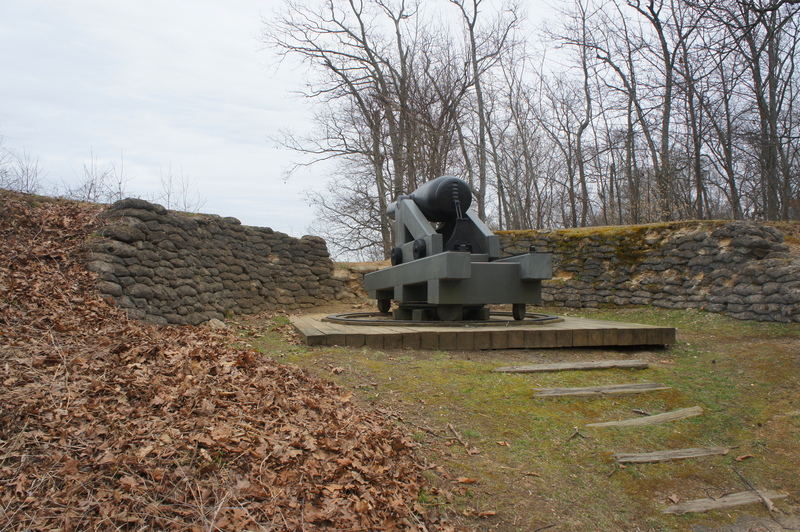 The fortifications at Drewry’s Bluff were expanded significantly after the battle, becoming a key training grounds for the Confederate Navy and Marines. From here the trail climbs to the outer perimeter of the fort structure, situated at the edge of thick woods. Circling clockwise around the fort, the footpath rounds a right-hand bend at ½ mile then crosses a short wooden bridge. Dropping down to the base level again, a wayside offers a photograph of what the “perfect Gibraltar” looked like at the time of the war. The loop ends back at the initial trail fork, situated just beyond the site of a former hot shot furnace. From here, head back on the initial trail you took to arrive at the fort. It’s about a 3/10 mile walk throughout the forest back to the trailhead and parking area. In total, allot 45 minutes to an hour for the round-trip hike. Stephen W. Sears, To the Gates of Richmond: The Peninsula Campaign (New York: Ticknor & Fields, 1992), 93-94. Sears, To the Gates of Richmond, 94. Sears, To the Gates of Richmond, 92-94. This entry was posted in Civil War, Easy Hikes, Richmond National Battlefield Park, Virginia and tagged Civil War, Drewry's Bluff, Drewry;'s Bluff Trail, historic, James River, Peninsula Campaign, Richmond, Richmond National Battlefield Park, Virginia. Bookmark the permalink.